Elizabeth came to me this morning with one of those paper fortune tellers. You remember the ones you made in elementary school with the numbers and colors, and you would open and close the paper until ultimately the fortune you had written under the flap was revealed? 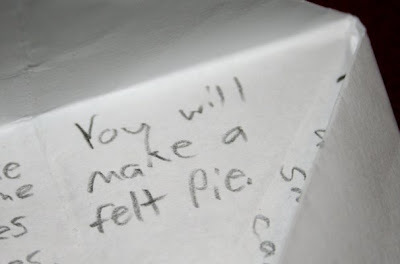 My fortune said "You will make a felt pie." Hmmm...coincidence? I think not. But I humored her and made a blueberry pie for her to share with her froggy friends. 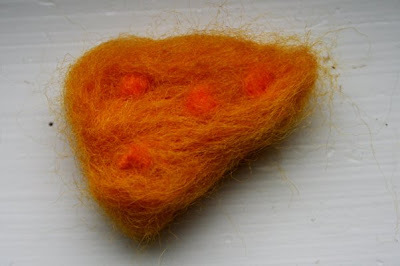 Ok, so it was a hastily felted pie, but she declared it tasty. I also finished working on an Easter hare for Finn's basket. He's my first knitted animal, and I thought he turned out quite cute. The directions came from All Year Round. Seriously, who knew about this book and didn't share that information with me? This book has wonderful ideas for celebrating the various seasons and holidays of the year. I know the whole family will get much enjoyment out of the projects we're discovering in here. 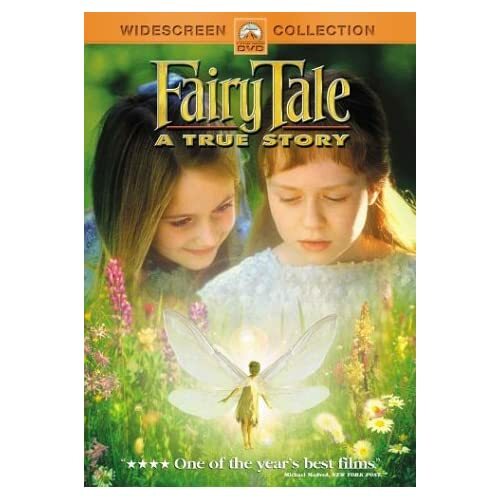 Elizabeth spent part of her day watching this adorable movie that we found on Netflix. 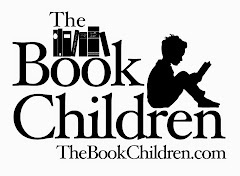 A charming story and sweet characters...Elizabeth asked at the end if they had made a sequel yet. Why can't more kids' movies be like this and less pop-culture-y with silly plots and shallow characters? Truly magical. Next up is Miss Potter, and we're looking forward to that one as well. Isn't needlefelting so much fun! Elizabeth did a nice job on the cheese. I haven't done it with J yet, did Elizabeth enjoy it? I've been wondering what to get from Netflix, now I know. Thanks for the recommendation. great job on the needle felting, Elizabeth and of course you too. I love the bunny! How adorable. sunny is dongdong. I keep getting mixed up. Are you feeling better Joy? I'm so glad Elizabeth is showing an interest in the felting--- sadly, Grady shows a great deal of interest in my needles. And in putting them near his eyes, which he thinks is hy-larious. Yeah, a real riot, kid. That bunny is so cute! Great job. 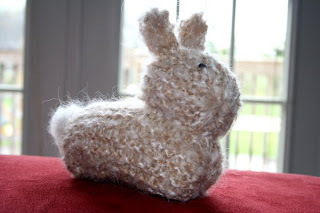 I have that book, and now I want to try making the bunny. 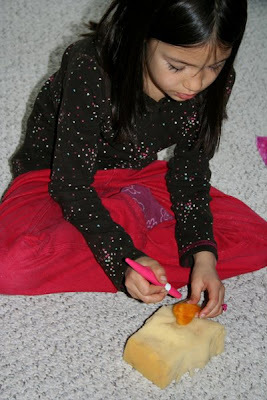 I never thought about making play food by needle felting...such a great idea. I think some of the bigger needle felted projects intimidate my daughter, but the food would be something good to start with. The cheese and pie are so cute. I LOVE how Elizabeth presented the idea to you! BTW, I think our girls would be great friends too...why does everybody have to be so far away?? Aaahh...isn't blogging great to document those little tidbits in life? We love that movie too. One of our favorites! 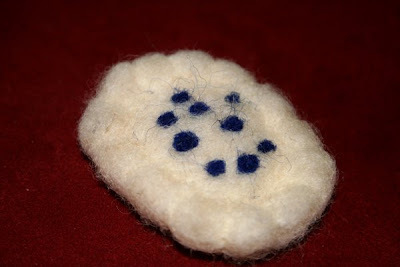 I love needlefelting. I just *wish* I wasn't allergic to wool. I love your bunny - looks so cute! I love your bunny, he is really beautiful, well done!